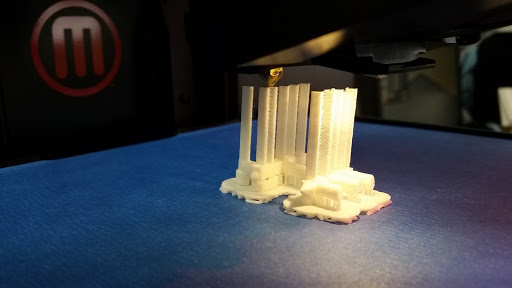 So last week i jump into the amazing world of 3D printing and I am completely hooked. All I want to do now is 3D print. It was truly the most amazing experience I have ever been a part of. However, as any good technology there always has to be a purpose. 3D printing has all of this in one small package. For this project my students had to research and design their own International Space Center. Students first researched and wrote a small report on the International Space Center and then got into Project Ignite to design their own. 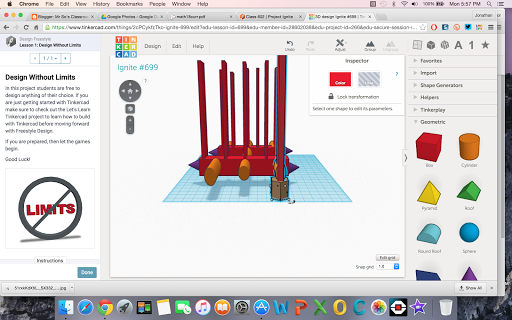 Project ignite is online tinkercad program. Now on the whole this project may look simple but it covers so many curriculum expectations. Throughout this project students are working at reducing and estimating the size of an object. They have to look at measurements that are in decimal notation and in standardize units. 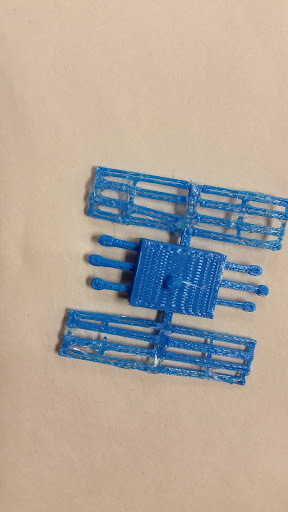 In addition, students also have to learn to scale objects down when we print or it would be to long. Taking an idea from your head and making it a reality always relates to some sort of measurement. In this case students were also required to look at specific measurements while they manipulated the program. Those that were successful at reading these measurements also had a more successful product. The whole project dealt in a 3D space. Students learned x, y and z planes and where able to manipulate these objects in the plane. Traditionally these transformational Geometry are taught on a 2D plane making it hard for many students to visualize what is happening. 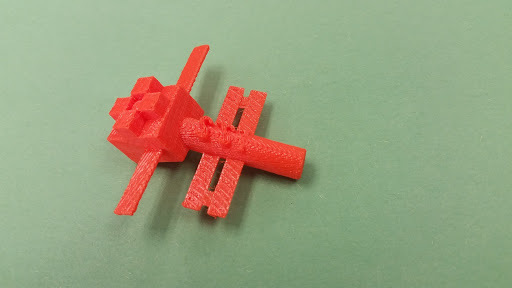 Using a product like Tinkercad allows students to practise and visualize in the proper space. Students also hit on their writing, reading and science curriculum. Students had to research, and read about the current ISS. 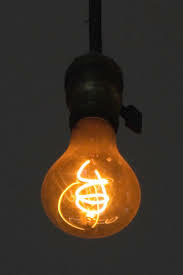 They had to know how it operated so that they could redesign the process. Not only did they do this but they also hit many of the 7 C’s that we talk about for 21st century learning. Throughout this whole process students were being creative, communicating ideas, collaborating with others as they had to figure out new tech, Critical think and problem solve out of situations, and be adaptable (which isn’t a c but a critical one non-the-less). Students where so engaged throughout this process and learned a lot about the ISS itself. As always it is never about the tech but the planning. This project took a lot of effort to plan and make it pedagogical sound for the students. They had to plan, research and then revise their plan even before they could work in the software. Once in the software portion they had to revise as some ideas didn’t work and even after we printed many of the students revised having learned that their projects wouldn’t work. This whole reflective and planning piece is critical to the success of any lesson involving new technology. 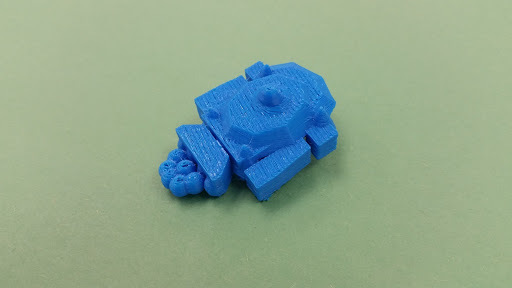 I highly encourage anyone to get their hands on 3D printing and do this in their classroom. 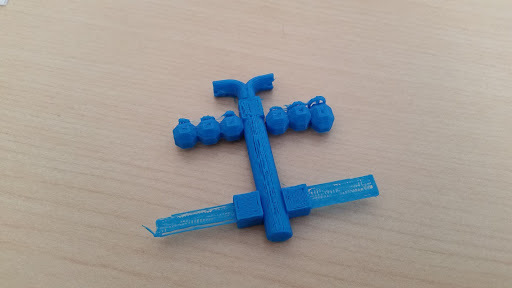 Even if you don’t print the aspect of working on Tinkercad was truly amazing in itself. The printing portion was just a nice add-on. Big thanks and shout out to David Cruz who brought the printer to us. What does it mean to have a reflective class? These book were revolutionary because it validated what I was already starting to do in the classroom. 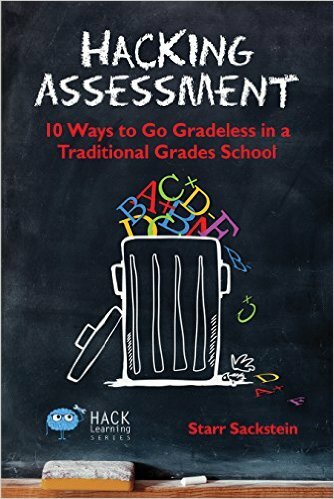 For a long time I have felt that the way I was assessing students wasn’t working. When I first started teaching I like many just followed what has been in place for centuries. We taught, we had students review and then we tested. We got data from these test but to be honest was it accurate or reflective of what that student can do? These were the questions that I asked for numerous years before I sat in my classroom watching my students taking a test. Some of my students started to ask their friends some questions. I was about to tell them to be quiet when I sat there a decided to listen. The types of questions I was hearing was basically what I already knew about these students based on my observations. Then as I was marking I kept nodding as I already knew why those particular kids got the marks they got. This is when it dawned on me that I already knew more about my students than any test was going to give me. Based on my interviews, observations and comments I made throughout the problem solving process, I already had a better picture of my students needs, next steps and achievements. This was the moment that I gave up formal testing. However, reflecting back I was still missing something. I had these amazing comments and observations I would share them with students but kids didn’t read them (well most kids that is). This took me a long time to reflect on this, which is why I was led to this amazing book. So what was I doing wrong? I was giving marks with my comments. I know this may seem like a simple thing but basically my students only honoured the mark and not the grade. If you think back to your own learning what have you always wanted, that lovely A. School has never been about the learning but always about the grades. This is true for our parents too. I come from a fairly traditional household and even when I came home with a 95% the reply back was where is the other 5%. It has been ingrained in our society to think about the letter and not what we need to achieve the letter grade. After reading the books I rapidly changed my practice. I started thinking about how I can make my students better at reflecting and honouring the learning process. We first started with looking at our Curriculum. Yes I actually read the curriculum document with my kids. Before each unit of study we sit down and reflect on what standards we need to learn based on what the curriculum says. I have the students tell me in their own words what they have to do to achieve the standards of their grade level. now I do teach grade 6 but I think this can be done at any grade you just may have to think about the amount of expectations that you want them to focus on. We also created a google form for their reflecting purposes. This is still a work in progress. This form gives me a quick look into my students thinking about what they thought they achieved and did on the assignment. Once these are submitted we have a conference about their learning where I either agree with their assessment or disagree. We also discuss next steps and my observations of their work. These conversations are about five minutes in length. I also turned to having students do a final reflection on what they think their term 1 report cards are going to look like. This took a while and I am going to try and shorten this process but I also got very rich and amazing discussions from it. Now you may think that grades are important but I have seen more growth this year in my students then ever before. It is funny because these comments was what I wrote on their reports even before I read their responses. I have found that the more students reflect and conference with you the more that they become in charge of their learning. Now this does take time. It is not something that can be done on the side; you must put the effort into making it a part of your practise and taking the time to reflect but the more that you do this the better students will get at it. I often hear that we need to prepare our students for what lies ahead but the reality is in life grades don’t matter. They mean nothing except for university and even the grades they look at are the last years. What we need to do is train our children to know how to get the grades they want. To set goals and learn what it takes to meet them. We are training our students for today because in doing so we train them for tomorrow. So I encourage you to a) read the books and b) jump in going gradeless. You have nothing to loose and all to gain. 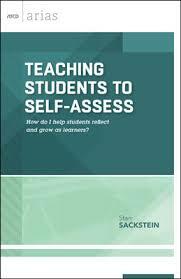 Author MrSoClassroomPosted on February 8, 2016 May 7, 2016 Categories classroom practises, Going gradeless, http://schemas.google.com/blogger/2008/kind#post, TTOGLeave a comment on What does it mean to have a reflective class?